Centralized database with package information, wanna-build. Build daemon software along installation documentation. 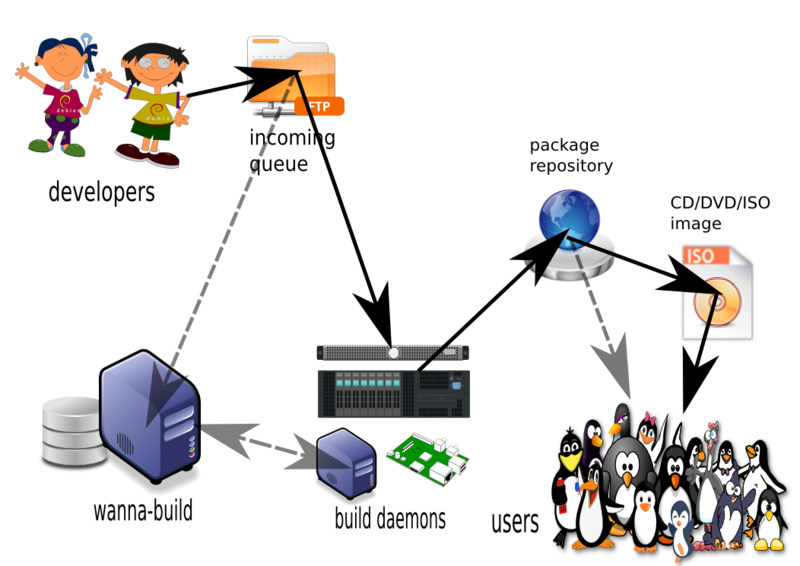 Thanks to Debian ftp-master and buildd team, all software is built for several architectures and several ports. Most Debian infrastructure is managed and maintained by Debian System Administration team. Debian Wiki has been growing different random pages trying to ease the setup and configuration problems concerning to Debian build system infrastructure. The above infrastructure barely documents what it is involved to create and generate Debian unstable (“sid”) distribution suite. In order to produce Debian stable distribution suite, there are software transitions to happen and yet another Debian team gets involved in the process, our beloved Debian release team. Once distribution reaches its maturity level and gets released as in its stable version, it gets updates also lead by release team and security related updates, which yet another team is responsible for them, the Debian security team. Great explanation, thanks for that. I’ll keep it for reference. But the graphic — gaah. It’s soooo sweet! You made my day.